So load the images onto a flash/pen drive and use the USB 'Pict Bridge' socket but on the Selphy this does not support flash/pen drives - even small ones - if I were at home I would get my multi card reader and transfer the images to one of the supported card types. One last chance the front of the Selphy has a short lead that pulls out and enables 'Pict Bridge' using the Selphy only to print and all choices then are made on the camera. Take a test image and it prints fine, next transfer images to the XD card on the camera and for some reason even though Windows can see the images the camera can't. So in the end I took the images home on a pen/flash drive and transferred them to my SD card and they printed fine. The Selphy is 18cm wide, 6cm tall and when closed only 12.5cm deep. In use however you need to add 18cm in front for the 15x10cm sheets in the caddy and the best part of 15cm clear behind as the sheets are all but fully exhaled out the back just prior to printing. The left side has the USB style 'Pict Bridge' socket and a standard USB socket so you could use it to print from a PC. The rear has the input for mains power and the right side has the input for the Dye Sub cartridge, you will get a 5 sheet starter cartridge and five post card type glossy sheets. The easiest way to purchase replacements is a pack containing a 36 sheet cartridge and 36 postcards. The ones used by the Selphy have a selvedge edge on both ends. The top of the unit has all the controls when printing from a camera card. There are ten buttons and what looks like a small 3.5x3.5 cm TFT display however this is not easy to read it is fixed under the plastic cover at a slight forward angle and it is actually smaller than that. You will need to know your images well to be able to identify them and you will need to do a lot of moving around to get a good view, certainly not a display to allow several people to view at the same time. The actual size of the image displayed is a maximum of 2.5x2cm and the only screen you can print direct from is 2x1.5cm. The images it prints are fine and as it is Dye Sub the image is always perfectly dry on delivery. Dye Sub is a four pass process and each image takes around 45seconds for this process. After the first pass you see an almost yellow sheet, the second pass shows a lot of red and the third blue by now the image will probably be recognisable and then after the forth pass through the unit your final image is delivered with just a tiny bit of the image overlapping the two selvedge edges and these are micro perforated and easily torn off. 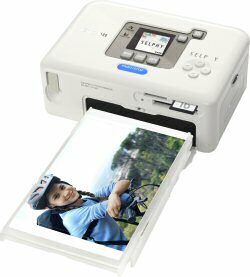 My idea of a portable printer is one that can print direct from a camera or a camera card. The very small fixed display on the Selphy makes this difficult. I would suggest this is far more use when attached to a PC as Canon always supply some excellent photo manipulation software with their printers so any adjustments can be carried out before the image is sent to the Selphy. I have three other portable printers waiting for review from HP, Epson and Kodak and these will be covered in the coming weeks. Doing my Internet searches found this at a best price of £48 from the first link below. does anyone know if you can buy a replacement paper tray for this printer selphy cp720?? The selphy CP720 works with xD cards as well as other "unusual" card formats. All you need is an adaptor. Easy to find and unexpensive. (taken from Canon.co.uk) - "Supported card types: Compact Flash, Memory Stick, Memory Stick PRO, Memory Stick PRO Duo, Memory Stick DUO, Microdrive, miniSD Card, mini SDHC memory card, Multimedia Card, SD memory card, SDHC Memory card, RS-MMC, xD-Picture Card"
It also prints with only 3 passes not 4 like you said.